At 611 acres, Lake Marble Falls is the smallest of the Highland Lakes, but it serves as a big backdrop for recreation. From fishing to standup paddleboarding, plenty of good times are packed into Lake Marble Falls. The biggest selling point of the little lake is it remains mostly steady at 737 feet above sea level. The small lake is perfect for personal watercraft. The lush green lawn at Lakeside Park is the perfect place to spend an afternoon with the entire family. The city park also features a pool, tennis and basketball courts, and picnic tables. There’s no shortage of sunshine at this year-round destination. This 130-year-old park is situated along the edge of Backbone Creek, which flows into Lake Marble Falls. Johnson Park has lush green lawns in addition to its amphitheater, playground, and pavilions. The city of Marble Falls is named after waterfalls that are now underneath Lake Marble Falls. Today, the waterfalls are impossible to see unless the lake is lowered for maintenance on the dam. On those rare occasions, the whole town comes out to swim and play on the falls. The scenic U.S. 281 bridge across Lake Marble Falls is also an important piece of history. Today, it has an easy flow of traffic with dedicated bridges for northbound and southbound lanes. The bridge that it succeeded, however, had a 77-year history. When the time came for it to be replaced in 2013, it went out with a bang with a controlled demolition in front of a crowd of thousands of cheering onlookers. The Max Starcke Dam was the last of the dams forming the Highland Lakes. The dam was completed in 1951 to produce hydroelectricity. It is named after Max Starke, who served the Lower Colorado River Authority for 15 years as the second general manager. The original floodgates were replaced with more modern hydraulic gates in 2005. Marble Falls Triathlon — Nearly 400 triathletes are attracted to this annual race for its scenic and challenging course. Hosted each summer, it begins with a swim on Lake Marble Falls, a bike ride through the Hill Country, and a run with the finish line back near the lake. Learn more in our racing guide. Walkway of Lights — During the holidays, Lakeside Park becomes illuminated by 2 million lights on more than 130 sculptures at the annual Walkway of Lights. Lake Marble Falls gives a stunning backdrop to the event as the lights reflect off the water. The free and family-friendly Walkway of Lights begins in mid-November and runs until New Year’s Day. The trail is a leisurely walk with hot chocolate, apple cider, cookies, and popcorn along the way. Marble Falls Community Fireworks — The Fourth of July at Lakeside Park is a fun evening with live music, family-friendly activities, food, and, of course, fireworks. The Marble Falls Community Fireworks show begins shortly after sunset in tune to patriotic music provided by KBEY 103.9 FM Radio Picayune. This fantastic display is one of the best fireworks display in the region. Lake Marble Falls is predominately stocked with largemouth bass, catfish, and sunfish. Anglers can also find crappie and white bass. This small, quiet lake is a relaxing place to spend the day fishing. Read the tips and tactics for fishing on Lake Marble Falls from the Texas Parks and Wildlife Department. Splash Boat Rentals, 1924 RR 1431 in Kingsland — Rents ski boats with wakeboard towers. Splash Boat Rentals will deliver and launch on lakes LBJ, Buchanan, Inks, and Marble Falls. Go to splashboatrentals.com or call (325) 388-5000. 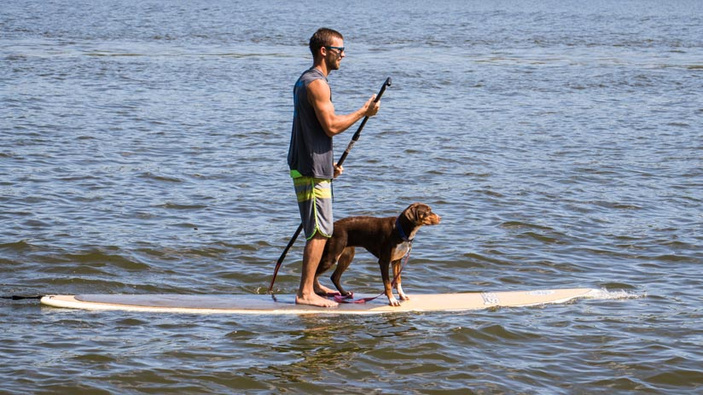 Jolly Rodgers Paddle Co., 120 Main St. in Marble Falls — Rents standup paddleboards on Lake Marble Falls. It also offers single kayaks and paddleboats. Go to jollyrodgerstx.com or call (830) 385-3819. Hampton Inn, 704 First St.
View dozens more places to stay in the Highland Lakes with our online Stay Guide. Lake Marble Falls is a laid-back destination perfect for people who love boating, fishing, swimming, bird-watching, and more. Spend an afternoon enjoying the cool water and soaking up the sun.